Located in Newport's historic hill neighborhood and within walking distance to shops, restaurants and historic attractions. Part of the prestigious Historic Hotels of America and on the National Register of Historic Places. Celebrating 80 Years of Hospitality (1926-2006) with special packages and offers throughout the year. One Bellevue Restuarant serves three meals and Afternoon Tea. SpaTerre offers massage, facials, body treatments, manicures and pedicures as well as Thai and Indonesian ritual treatments. Whether planning a small executive retreat or an extravagant affair, we can accommodate meetings in an intimate or grandiose scale. Hotel Viking showcases a team of wedding services professionals who are seasoned experts at wedding planning and helping you choose the perfect wedding hotel reception site and executing every detail. Includes Regular Coffee, Decaf Coffee and Assorted Hot Teas, Assorted Rolls with Butter for the Table Fresh Soup or Salad Choice, Entrée Choice and Dessert Choice. See our attached menu for all of your plated dinner options. Please see our attached menu for buffet details. Options to create your own buffet as well! I attended a wedding reception for a good friend at The Hotel Viking. This historic hotel is beautiful and its elegant ballroom was the perfect setting for a formal wedding. My friend, the bride, said planning the wedding was easy because of the excellent staff that helped her with every detail. 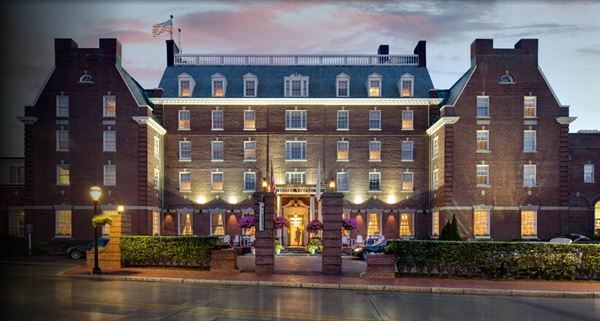 The location of the hotel was ideal for the out of town guests who spent the weekend as the hotel was within a short walking distance to the shops, restaurants and sights of Newport. Special Features: Overnight parking charges apply for self-parking and valet parking.